Our Encased Coil with Memory Foam mattress brings together the buoyant feel of coil support with the responsive comfort of memory foam. 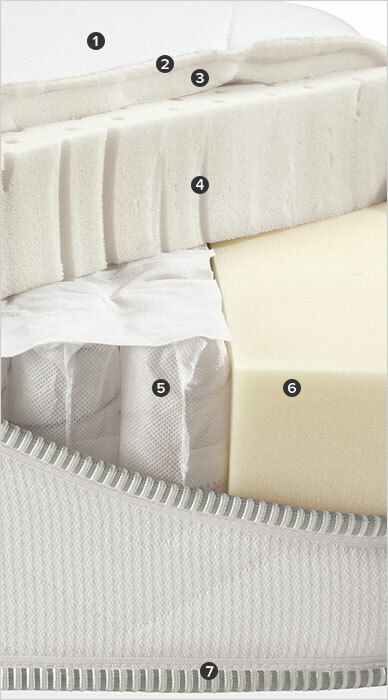 Independent, wrapped coils provide proper orthopedic support and isolate movement so you and your partner can sleep undisturbed. Low-VOC memory foam further reduces partner disturbance and relieves pressure on your joints for less tossing and turning. Plus, air is able to move through the coils and ventilated memory foam for a cooler sleep experience than a typical memory foam mattress. With a feel that’s not too soft and not too firm, this safe mattress accommodates a wide range of comfort preferences and contains no flame retardant chemicals.